Many years ago, production of license plates was low-skilled work which could be done with simple tools. The only requirement back then was to have a clear display of license number so that it was easy for law enforcement to perform their duties. As society advances, vehicle owners demand better quality and styles for their license plates. We, as the manufacturer of license plates, should also advance with time. shortcomings. Typically, laser printing and inkjet printing work best on white paper. When used on reflective materials, they will cause obvious distortion of patterns and fonts. The pattern designs only include the honeycomb pattern, fish pattern, lattice pattern, and stripes, which have stayed the same for many years. 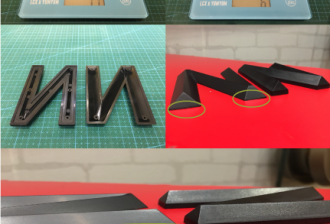 Based on numerous trials and verification, our R&D department finally invented a new printing technique for license plate. Its accuracy and coloring are close to 100% to the original design. To develop best fonts and patterns, we hired design experts to search, select, and modify various fonts so that the fonts can be fully shown in an appropriate scale. The pattern design is also extremely challenging. Not all patterns are suitable on license plates. In addition, our designers need to take into consideration whether the reflective material has enough reflective rate so that the license plate is clearly visible. We fully understand that our brand and credibility are built by our accumulative effort. Therefore, we do not lax even a tiny bit in our procurement of materials, quality control, product development, and customer service. 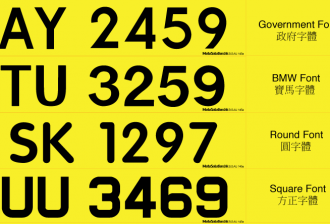 Order via on-line, number plate would be ready when you arrive our shop. I would like to have my order shipped to me. However, will the license plate easily get damaged during the shipping process? The cardboard box we use is made of three layers of corrugated paper. Such a sturdy box guarantees your license plate to be intact upon arrival. Yes, we do provide installation instructions. For motorcycles, we will drill the holes at the locations provided by the customer. For some Japanese cars, the distance between the center of screws is always 21cm. Customers only need to provide us the height for the holes. 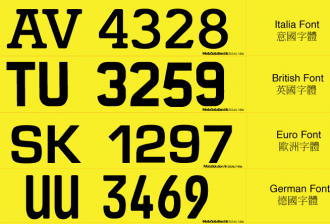 For European and American cars, license plates are typically glued on. We will provide some stickers. How to measure the position of the holes? Please refer to the diagram. Customers need to provide the distance between the two centers, indicated as distance a on the diagram. 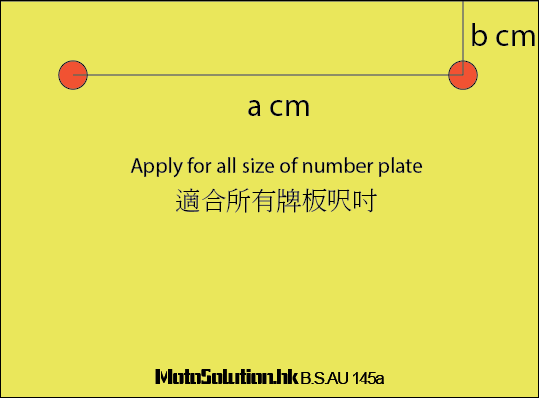 The height is indicated as b. The other two sides are symmetric. I am concerned that I cannot install the license plate if I fail to provide accurate hole positions. The diameter of the screws is 6MM. We will drill a hole of 8MM. The head of the screws is 12MM in diameter. Therefore, the holes will be fully covered by screws. Your license plate will not encounter any unsightly situation. Do I need many tools to install my license plate? For European and American cars, you need to glue the license plate on. If the new license plate is smaller than the old one, it may not fully cover the sticker mark left by the old plate. We use high quality nylon screws. You only need to tighten them during installation. Do not apply excessive force. Otherwise, you might break them.